With Coheed and Cambria supporting! 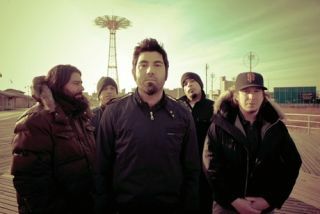 Deftones have announced details of their 2010 UK tour. Abe Cunningham and the boys have revealed a seven-date jaunt, and they're taking Coheed and Cambria out with them. Take a look at the clips below (of Deftones in full flight and a technical masterclass from Coheed's Chris Pennie) to see why you have to get yourself to one of these shows. Tickets are on sale from Friday.